They say that every picture tells a story, and to a degree the one below is no different. 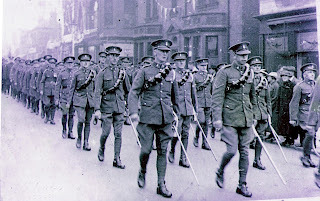 Goole had prior to the 'Great War' a 'company' of Territorial soldiers which formed part of D Company, 1/5th Battalion King's Own Yorkshire Light Infantry. This battalion landed in France, at Boulogne, on 12th April, 1915, along with 1/4th Bn K.O.Y.L.I. On 2nd February, 1918, the 1/5th and 2/5th were absolved in to one unit which became 5th Battalion K.O.Y.L.I. 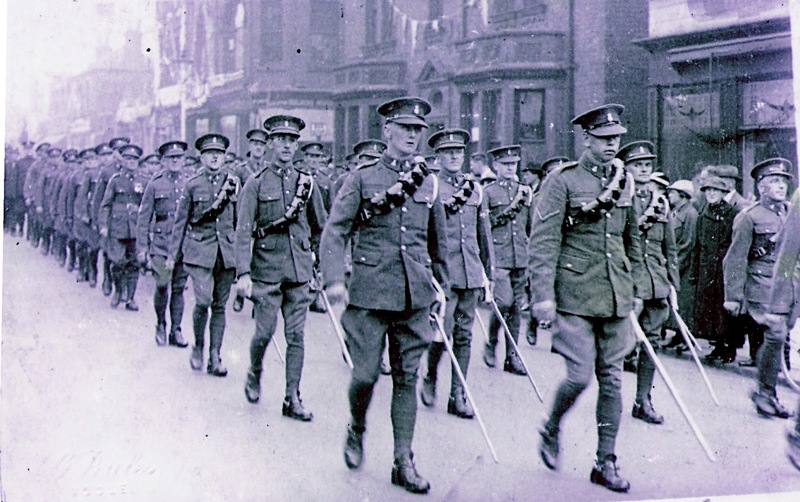 Taken in early 1919 it shows the Goole 'Territorials' of D Company 5th Bn King's Own Yorkshire Light Infantry marching behind members of the Queens Own Yorkshire Dragoons, during a parade to mark their return from France. The evidence for this can be seen from the 'bunting' that adorns the buildings of Boothferry Road - No.13 'Anglesey House', formerly the home of Dr. Blair (now NatWest Bank); No.15, the premises of Fred N. Huggins, Ironmonger, on the corner with Paradise Place (later Woodcock Travel); No.17, Arthur Rockett, Hosiery, and No.19 the offices of 'The Goole Times' newspaper. The building with the double chimney was the shop run by Harry Bloom. Further evidence of when the picture was taken can be seen by looking at the faces and demeaour of the men themselves. Many of the faces betray the effects of having seen action in the trenches, the ever-lasting mud, and other horrors that formed the enduring hell that was the 'Great War'. Another feature of when the picture was taken is that, aside from one man, nobody else is wearing any medals. The man who is is Colour Quarter-Master Sergeant Sugden, and the medals he wears are the King's and Queen's Medals for service in South Africa, both of which appear to have 'bars' (denoting 'actions' at which he and his unit was present at). The officer leading the detachment of the K.O.Y.L.I. is Lieutenant L. W. Silvester (with the officers belt over his right shoulder and seen between the last two men of the right column wearing shoulder pouches of the Q.O.Y.D.). The men of Goole who fought as part of the King's Own Yorkshire Light Infantry and who lost their lives during the First World War form a signifiacnt number of those named on Goole Cenotaph - 121 men of the 452 named on the plaques; of this number thirty-nine served in either 1/5th, 2/5th or 5th Bn. This number is further increased when examining those who had connections to Goole who also lost their lives, but who are not named upon the Cenotaph - 16 men from a total of 99 who served within the K.O.Y.L.I. My great uncle, Richard ELLIOTT, brother of my Grandmother, Maud ELLIOTT, son of Thomas ELLIOTT and Mary Elizabeth NICHOLLS, was born 13 Jun 1894 in the Duckles Buildings in Old Goole. Richard served in WW I with the King's own Yorkshire Light Infantry, 8th Battalion. He died 01 Jul 1916, at age 22, on the first day of the Battle of the Somme. He is listed on Goole Cenotaph and his name is amongst the 75,000 missing British Officers and men from the Battle of the Somme on the Thieval Memorial in France. My wife and I have been to Goole in 2006, 2008 and 2012 and in 2008 we visited the Thieval Memorial in France. My Grandmother, Maud ELLIOTT was sent to Brantford, Ontario as a girl of 15 in 1905. Her widowed father Thomas, chose to send her to his father's, Richard ELLIOTT, younger sister, Harriet MANN (nee ELLIOTT) who had married John MANN before she and her family emigrated to Canada about in about 1867. Maud ELLIOTT, never saw any of her immediate family again although her two sisters Mary Ann and Minnie married and lived in Goole. Mary Ann ELLIOTT married Percy PRATT and Minnie ELLIOTT married Arthur SAYNOR. Ive been trying to look up a bit of history about the Drill hall in Pasture Road & its Servicemen. This is fantastic & you are a credit to them. If you have anything on the Drill hall or Servicemen I would be most greatful if you could share it with me as so much is been forgot about our history & what makes Britain PROUD? My great - uncle (46588 Private Albert W. Whittaker K.O.Y.L.I.) served in the 'D' Company, 5th Battalion and was killed in action. He is buried in Gezaincourt Communal Cemetry Extension, France.